The Surrey Food Bank often receives donations related to birthdays and celebrations, here is one couple’s story. Early on when we found out we were expecting, I realized how blessed this baby would be to have two sets of first-time grandparents, a mom and a dad in a relatively stable home with lots of future aunts and uncles to dote on her. So what could be more meaningful if our baby celebration turned out to be a baby food drive that would bless many more babies. Instead of blessing one baby, we asked our friends and Church family to think of the families who use the Surrey Food Bank to access some of the most essential baby needs: infant formula, baby cereal, diapers, wipes and baby food provided through the Tiny Bundles program. 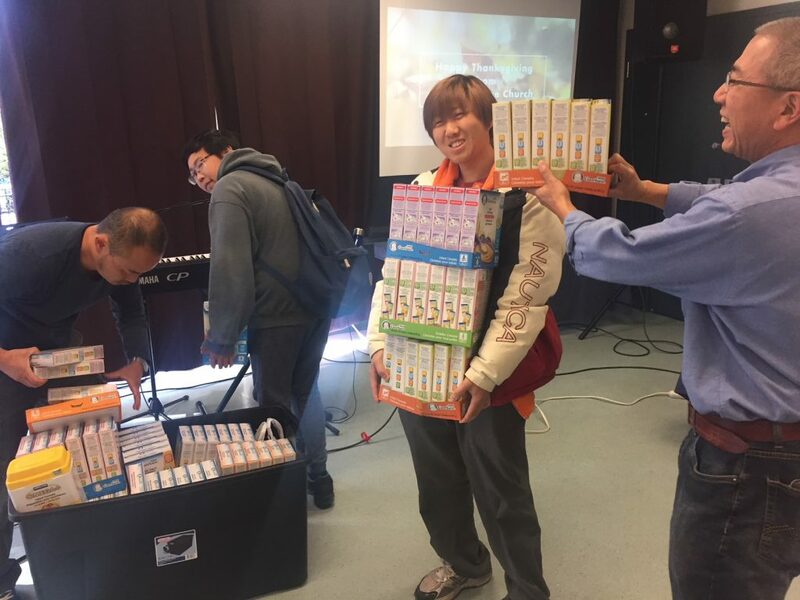 Our church, Urban Village Church, focused on collecting formula and baby cereal during our joint Thanksgiving and baby celebration. With baby cereal being much less expensive than formula, it was important to give people options to contribute knowing that everyone’s capacity for giving is different. Our goal was to collect an ‘ambitious’ 40 items. To celebrate reaching 40 items, my husband Derek and I would host a baby gender reveal and then serve up a beautiful cake for the 30 to 40 guests. I wasn’t so sure we were going to reach 40, so to thank everyone for however many items we received we would go ahead with the baby gender reveal anyways. Little did I know the enthusiasm and generosity from our community exceeded our initial goal beyond measure. So much so that we didn’t even bother counting the items. I guess we should have been prepared to be amazed at how much everyone embraced the drive. Therein was a lesson, people are eager to act when presented with an opportunity to contribute, especially if it’s about helping our neighbours. Hunger is one of those hard to see but pervasive problems in B.C. And although more permanent solutions are needed, food banks provide an essential safety net for many in the meantime. Food banks have been in BC for at least 30 years and according to Food Banks Canada, use reached an all-time high in 2016 at 103,500 people assisted (a third being children), and an overall increase of 32 percent from 2008. This year at Urban Village Church, we started with the theme of ‘It Takes a Village’ to bring about change in our communities. We can only do so much individually, but when we each contribute a little together we can accomplish so much more. It is my hope that you too may consider the food bank in the future. Editor’s Note: 41% of the Surrey Food Bank’s clients are children and babies — the largest percentage of food bank clients under 18 in the country. We are happy to have our Tiny Bundles, Toddler Totes and Pre-K 2 to 5yr programs in place to support the babies and children in need. If you can put your creativity and spirit toward helping us with this need, Thank you! People like you make it possible for us to do what we do.